Edith A. Holcombe was the daughter of Henry Holcombe and Juna Delph. Albert Holcombe was the son of Henry Holcombe and Juna Delph. Lived on a farm near Bloomington, Ill; moved to Baxter Springs, Kansas, where both died. Almina Holcombe was born on 3 September 1842 at Andover, Ashtabula Co., OH.1 She was the daughter of Joel Holcombe and Orilla Jones. Walter Ballard was the son of James Ballard and Almina Holcombe. Horticulturist who lived near Baltimore. Grace Ballard was the daughter of James Ballard and Almina Holcombe. Lived in Oklahoma. Moved to Bloomington, Ill., in 1864; later moved to Palatka, Florida where both died. Albert H. Holcomb, for nearly thirty years a highly respected citizen of Palatka, died last Sunday morning shortly after six o'clock, full of years. One needs to go back but three short years to remember this cheerful, kindly Christian gentleman in the full vigor of life, and as a potent force in the community for all that made for a nobler citizenship. His cheering smile and kindly hand grasp were among the pleasures of the street. Then he was suddenly stricken with paralysis and went into the retirement of his home. His has been a lingering death since, but he was prepared to meet it. Palatka as a city had become accustomed to his absence from the street and the market place, but to his home and intimate friends his life has been an inspiration even through the long days of his decline. He was formerly a contractor and builder, and later went into the mercantile business. He was identified in his religious life with the Methodist church and was one of the more active in the work of the church. He is survived by his wife and four children, Messrs. Harry, Raymond and Ernest, and Miss Mabel Holcomb, the latter a teacher in the Palatka schools. Albert and Jane were enumerated in the 1900 Palatka, Putnam Co., FL, federal census. He was a carpenter age 56, she was 53. Jane had 4 children, all still living. Children in the household were Raymond E. 17, Ernest 14, and Mabel 12. 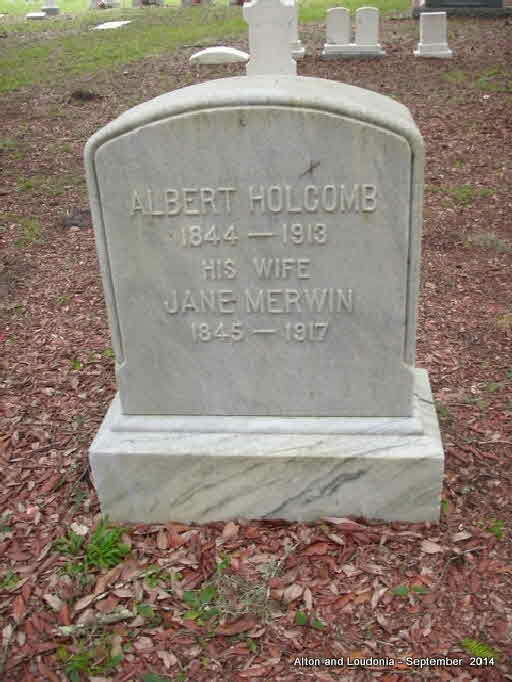 [S807] Find A Grave, online http://www.findagrave.com, Find A Grave, database and images (https://www.findagrave.com : accessed 21 June 2018), memorial page for Albert H. Holcomb (1844–26 Sep 1913), Find A Grave Memorial no. 102363705, citing West View Cemetery, Palatka, Putnam County, Florida, USA ; Maintained by Mack Wills (contributor 46912082) . Jane Clark Merwin was born on 18 January 1844. Jane Clark Merwin also went by the name of Jennie Merwin. She married Albert H. Holcombe, son of Joel Holcombe and Orilla Jones, on 10 April 1878 at McLean Co., IL. Jane Clark Merwin died on 17 July 1917 at age 73. Jane Holcombe lived at Ashtabula Co., OH. She was born on 11 April 1845 at Andover, Ashtabula Co., OH.1 She was the daughter of Joel Holcombe and Orilla Jones. Jane Holcombe married Henry Milton Arner on 20 October 1877 at Ashtabula Co., OH. Jane Holcombe died on 17 May 1939 at Ashtabula Co., OH, at age 94. Seaver shows a child "Arner", don't know what he means by that. Henry was enumerated in the 1870 Andover, Ashtabula Co., OH, federal census, in the household of his father and mother, George and Nancy. He was a farm laborer, age 24, born in Ohio. Henry Milton Arner was born on 1 January 1845 at Greene, Trumbull Co., OH. He married Jane Holcombe, daughter of Joel Holcombe and Orilla Jones, on 20 October 1877 at Ashtabula Co., OH. Henry Milton Arner died on 17 May 1924 at Ashtabula Co., OH, at age 79. Sabra Orissa Arner was born on 24 February 1882. She was the daughter of Henry Milton Arner and Jane Holcombe. Ruth Orilla Arner was the daughter of Henry Milton Arner and Jane Holcombe. Ruth Orilla Arner was born on 26 May 1884. Sabra Holcombe lived at Pasadena, CA. She was born on 8 February 1847 at Andover, Ashtabula Co., OH.1 She was the daughter of Joel Holcombe and Orilla Jones. Sabra Holcombe married Warren Clark on 6 May 1868. Warren and Sabrina were enumerated in the 1900 Collinwood Village, Cuyahoga Co., OH, federal census. He was a Locomotive Engineer, age 55, she was 53. Children in the household were George A. 28, and Norman W. 20. Also in the household was mother-in-law, Orilla Holcombe, age 76. Warren Clark was born in September 1844.1 He married Sabra Holcombe, daughter of Joel Holcombe and Orilla Jones, on 6 May 1868. George A. Clark lived at Pasadena, CA. He was born in June 1871 at OH.1 He was the son of Warren Clark and Sabra Holcombe. James De Witt Holcombe was born on 16 June 1848 at Andover, Ashtabula Co., OH.1 He was the son of Joel Holcombe and Orilla Jones. Bertha Holcombe was the daughter of James De Witt Holcombe and Lydia L. Green. Lived on a farm in Iowa. Bessie Holcombe was the daughter of James De Witt Holcombe and Lydia L. Green. Bessie Holcombe lived at Canton, Ill.
Gilbert Holcombe was the son of James De Witt Holcombe and Lydia L. Green. Mary Holcombe was the daughter of James De Witt Holcombe and Lydia L. Green. Everett C. Holcombe was born on 7 March 1854 at Andover, Ashtabula Co., OH.1 He was the son of Joel Holcombe and Orilla Jones. Everett C. Holcombe married Sarah Selby on 4 May 1881. Everett was enumerated in the 1920 Andover Twp., Ashtabula Co., OH, federal census, page 14B. He was a widower, not working, age 65. Sarah Selby married Everett C. Holcombe, son of Joel Holcombe and Orilla Jones, on 4 May 1881. Sarah Selby died on 31 August 1900. Mary Orilla Holcombe was born on 29 April 1884. She was the daughter of Everett C. Holcombe and Sarah Selby. Moved to Los Angeles, where Louis died. Grace Estella Holcombe was born in April 1887. She was the daughter of Everett C. Holcombe and Sarah Selby. Grace Estella Holcombe married Louis Oliver Granger, son of Isaac Newton Granger and Asenath Gaylord. Louis Oliver Granger was born on 24 September 1887.1 He was the son of Isaac Newton Granger and Asenath Gaylord.1 Louis Oliver Granger married Grace Estella Holcombe, daughter of Everett C. Holcombe and Sarah Selby. Lewis O. was enumerated in his parent's household in the 1910 Andover, Ashtabula Co., OH, federal census. He was 22 and a bookkeeper. Louis O. and Grace E. were enumerated in the 1920 Cleveland, Cuyahoga Co., OH, federal census. He was an auditor in a mine car company, age 32, she was 32. Children in the household were Frances L. 5, and Ruth J. 2 years 3 months. [S622] James N. Granger, Launcelot Granger, page 428. [S25] Hannah McPherson, Holcombe Genealogy, Page 184.2, Item A-8-1-6-8-5. Children of Betsey Holcombe and Simeon Smith Viets Jr.
[S161] Carol A. Laun, Granby Center Cemetery, Page 115. Simeon Smith Viets Jr. was born in 1802 at MA. He was the son of Simeon Smith Viets. Simeon Smith Viets Jr. married Betsey Holcombe, daughter of Philetus Holcombe and Theodocia Reed, on 16 April 1828 at Village of North Granby, Granby, Hartford Co., CT. Simeon Smith Viets Jr. died on 4 December 1851. Simeon was a cigar maker who empoloyed 5 women to roll 36,000 cigars per year at $5 per month. [S208] Dorothy Dean Viets Schell, Viets, Page 91/Item 122. Lewis Holcombe was born on 29 March 1808 at Granby, Hartford Co., CT. He was the son of Philetus Holcombe and Theodocia Reed. Lewis and Lovinia were enumerated in the 1850 Granby CT federal census with children Edwin, Hellen, Frances, and Frederick. He was a whip-maker with real estate valued at $3,325. He employed eight men and over 30 women. The men made up to $26 per month, the women a standard $5. Lewis and Abigail were enumerated in the 1860 Granby, Hartford Co., CT, census with Frances and Frederick. McPherson lists his marriage to Abigail Galpin as "possible." There is a Lewis Holcombe enumerated in the 1880 Grand Rapids, Kent Co., MI, federal census. He is 74, a tanner, born in CT. His wife is listed as Galpin Holcomb, 65, born in CT. They have a grandson in the household William Dickenson, 25, born in CT.
Dan Holcombe was born at Granby, Hartford Co., CT. Moved to Pa. He was the son of Philetus Holcombe and Theodocia Reed. Hannah Holcombe was born at Granby, Hartford Co., CT. She was the daughter of Philetus Holcombe and Theodocia Reed. Hannah Holcombe married Oliver Barker. Oliver Barker married Hannah Holcombe, daughter of Philetus Holcombe and Theodocia Reed. Of Tarriffville, CT.
George Holcombe was born at Granby, Hartford Co., CT. He was the son of Philetus Holcombe and Theodocia Reed. George Holcombe married (?) Fletcher, daughter of Eber Fletcher. (?) Fletcher was the daughter of Eber Fletcher. (?) Fletcher married George Holcombe, son of Philetus Holcombe and Theodocia Reed. [S161] Carol A. Laun, Granby Center Cemetery, Page 75. [S178] Christina Bailey and Lorraine Cook White, Barbour: Granby, Page 95. [S178] Christina Bailey and Lorraine Cook White, Barbour: Granby, Page 114. Maud Holcombe was born on 4 December 1856. She was the daughter of Edwin Holcombe and Lucy G. White. Hattie Holcombe was born on 7 April 1860. She was the daughter of Edwin Holcombe and Lucy G. White. Alfred Holcombe was born in September 1861. He was the son of Edwin Holcombe and Lucy G. White. Louisa Holcombe was born on 11 February 1864. She was the daughter of Edwin Holcombe and Lucy G. White.